In August 2011, Chris Harker, co-founder of Triple C Brewing Co. in Charlotte, North Carolina, walked down a platform along the city’s light rail system, a half-barrel keg of his brewery’s Light Rail Pale Ale on a green dolly as cameras clicked and well-wishers, including relatives, walked along with him. Harker was delivering the beer to Triple C’s first commercial account—The Liberty gastropub, which also happened to be one stop away along the same light rail. He did not actually take the train the one stop to The Liberty—“the city got wind of it,” he says, and dissuaded him from taking alcohol aboard—but Harker says the brewery wanted to highlight the role the light rail had played in Triple C’s young life. 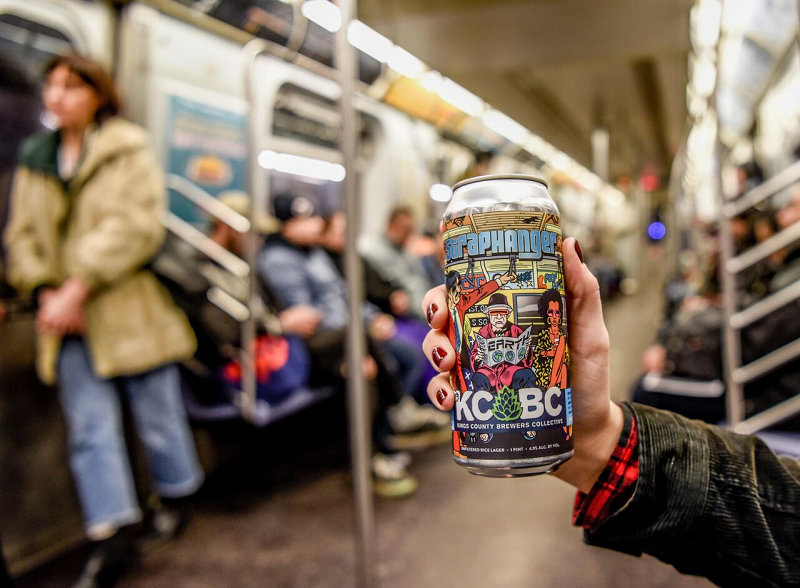 It was a small, but illustrative moment in the relationship between American small-batch brewing and public transit, in particular the nation’s warrens of subway, trolley and light-rail routes. In some places, the two have grown up around each other—Charlotte’s so-called LYNX system dates from only 2007, a few years before the city’s new wave of breweries would take off. 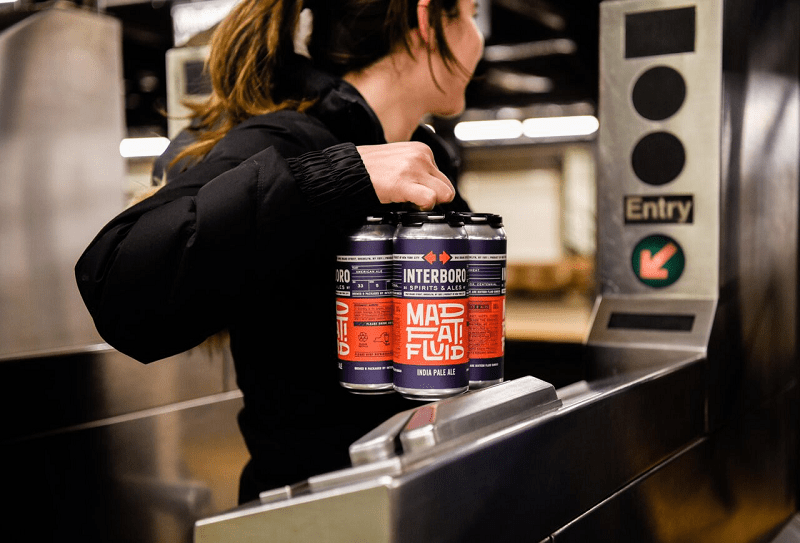 In all cases, the two have powered a symbiotic relationship: Get back and forth from sampling the latest brews, liberally or not, at a transit cost well under that of even an Uber. In fact, ride-hailing apps such as Uber and Lyft might be the biggest threat to this symbiosis. In the meantime, anecdotal evidence abounds of the happy relationship between breweries and their proximity to a public transit stop. The hard numbers, too, suggest there’s something about hops and hopping a train. In the summer of 2006, Gail Ann Williams and Steve Shapiro, a married couple living in San Francisco, were planning to attend an IPA festival at The Bistro, a groundbreaking bar in Hayward several miles to the south (the pub had hosted some of the nation’s first festivals dedicated to India pale ales and double IPA). “You know, you should take BART there; it’s three blocks away,” someone suggested, given the strength of the beers that The Bistro would be serving. The suggestion planted a seed in the minds of Williams and Shapiro that sprouted the following year into a website called Beer by BART—which is literally what its name implies: a curated guide to breweries, brewpubs, bars and bottle shops near Bay Area Rapid Transit stops. So great proved the appeal—inexpensive and safe transport to the region’s best beers—that the couple soon had prospective brewers assuring them that they were looking for locations near the San Francisco Bay Area’s trolley and subway system. Brewers wanted in, basically, on the publicity that Beer by BART could provide. What’s more, Williams and Shapiro became mini-celebrities not just in their own city, but also the world over. “It’s amazing how many people we meet traveling, including Europe, who say they use this as part of their vacation planning, including for where they should book a hotel,” Williams says. Similar updated and one-off guides have sprung up in Beer by BART’s wake. And some cities and regions interweave brewery visits with their transit systems. In Phoenix, for instance, a downtown booster group sponsors an annual “Urban Ale Trail,” a “walkable beer tasting tour [that] runs along the light rail corridor from Downtown Phoenix to uptown.” In Charlotte, there’s the 4.5-mile “Light Rail Trail” that not uncoincidentally runs by several breweries and brewpubs (including the aforementioned Triple C). In Chicago, the Blue Line of the city’s vaunted L system happens to run right from O’Hare Airport into downtown—and past roughly 10 breweries and brewpubs. That includes Revolution Brewing, which opened near the Blue Line’s California stop in 2010 (the company opened a second location near the line’s Belmont stop two years later). Romance or not, that utilitarianism benefits breweries and even draws them close to public transit in the first place. The biggest reason is obvious, given the intoxicating core product of breweries and brewpubs. “Especially when people are enjoying some fine craft brews, it’s great to have public transit around the corner so they don’t have to drive home,” says Revolution’s Deth. The proximity can also have fringe benefits, brewery principals say, including lower-cost transportation for brewery staff and advertising opportunities onboard the transit itself (though some systems, including the nation’s largest in New York, forbid alcohol ads). Perhaps the biggest benefit besides a safe, cheap way home after drinking is what public transportation can bring to a neighborhood. Triple C’s Harker noticed it in his South End surroundings in Charlotte. Too-quiet streets and empty buildings, including the 20,000-square-foot, high-ceilinged building that Triple C eventually opened in, pocked its future neighborhood. The 4-year-old New Bern light-rail stop offered promise, though, Harker says. And now the brewery-plus-taproom is part of a more vibrant enclave with fresh condos and apartments. Hyde Brewing recently opened across the street from the brewery, and Triple C opened its own new event space next door as well. 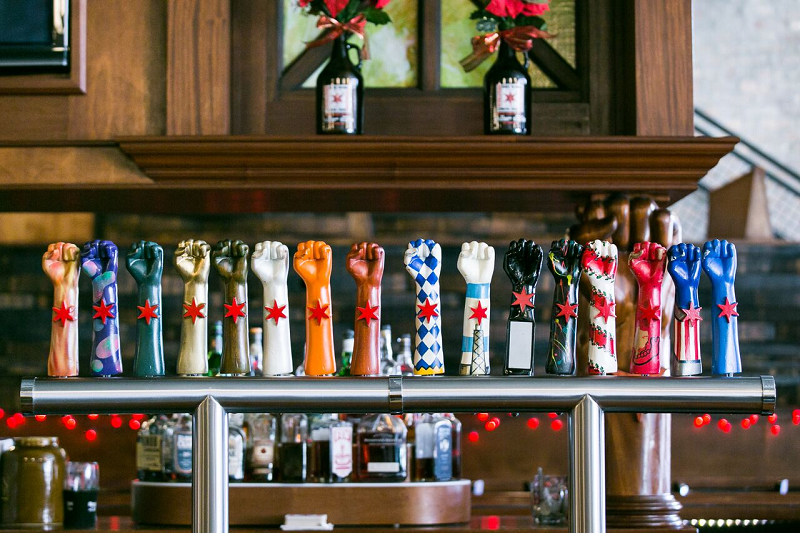 “So we get a lot of walk-ins and repeat taproom business from people just because it’s easy for them to come see us,” says Harker. Public transit stops not only facilitate such activity, but also sustain it once it’s there—sometimes for decades, in the case of the nation’s older systems. The L line in New York City, for instance, dates from the early 1920s, Chicago’s Blue Line from the early 1950s. They were in place long before the current brewing renaissance kicked off in the late 1970s, ready and waiting to help spirit it along. And they might yet outlive their usefulness to it. Public transportation ridership nationwide spiked to 10.8 billion rides in 2014, the highest ridership in 58 years, according to the American Public Transportation Association, an advocacy nonprofit. In 2015, systems in Chicago and Boston recorded their highest ridership figures ever (the Chicago milestone was for trains alone). The same year, 1.76 billion people rode New York’s system—including a single-day rec­ord of 6.2 million straphangers on Oct. 29, 2015. These mid-decade figures, however, might have represented a high-water mark for public transit. Figures from 2016 and 2017 show steep declines in some cases. In Charlotte, bus ridership was down 15 percent for the three years that ended in mid-2017. In Los Angeles, overall ridership was down about 19 percent over a similar period. Part of the drop is due to aging or inadequate infrastructure. The tracks, tunnels, vehicles, fare machines and other systems simply aren’t up to the task of moving so many millions daily, and that fact manifests itself in delays, re-routings, and even accidents. New York officials, for instance, plan to close the tunnel that carries the L between Manhattan and Brooklyn for 18 months beginning in 2019. It needed repairs before Hurricane Sandy damaged it in October 2012, and now the need is particularly urgent. Then there’s Uber and its ilk. The rapid rise of ride-hailing apps—Uber launched in 2009, and archrival Lyft in 2012, both initially in San Francisco—has upended the taxi industry. It has also, to a lesser extent, started to eat into public transit with sometimes-competitive fares and typical door-to-door service. A survey of app users in seven major U.S. metro areas that University of California-Davis researchers administered showed that Uber et al have led to a 6 percent decline in bus use and a 3 percent decline in light rail use among those who have used the apps. The survey’s results, released in 2017, also showed that avoiding driving drunk was the second-most-cited reason for using the apps, right behind avoiding parking headaches. For now, though, the symbiosis continues. The number of breweries in the U.S. continues to climb, with many opening in cities with already widespread transit systems, or ones that are on the fast train there. New York City has 30 breweries and brewpubs, according to the Brewers Association, and Chicago has 47. Breweries continue to open near the LYNX light rail in Charlotte’s South End neighborhood, and a new extension will see it head north through the city’s North Davidson and University areas. Existing breweries in its path stand to benefit, and new ones may spring up as a result. For Harker, there’s little doubt the light rail played a part in his brewery’s success over the years. Next Next post: Craft beer is booming. Is that bad news for the U.S. economy?